Farmgirl Fare: Monday Dose of Cute: It's Monday! Wishing you a smile-filled week. © FarmgirlFare.com, loving and laughing with longears. Are you kidding me? I've always wanted a pair of donkeys...these guys are adorable! Thanks for the smile. Do they like belly rubs? Because MAN I'd be tempted to go in for one what with all that fuzzy belly waving they're doing. Effing cute donkeys! It actually looks rather warm there compared to here in eastern Ontario where. It is about 20 F this morning. 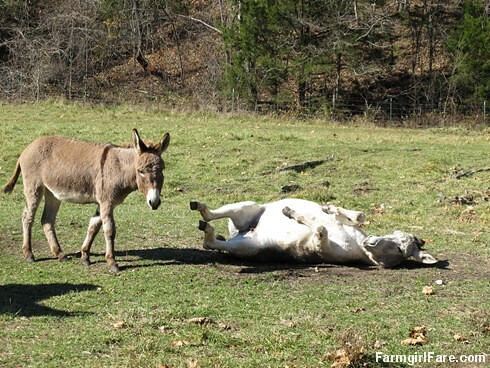 The donkeys look happy. Ditto Fiinny's comment :)...when my beagles go down for a roll, i can't resist kissing the underbelly! So nice to see the longears,they always make my day. Seeing your furbabies gives me a smile even if my day isn't always going great. I have 2 small dogs and 3 cats but seeing yours outside in the lovely nature setting enjoying themselves is a special treat. Mr Bert is a favorite not taking away anything from the other doggies. He just knows how to pose. 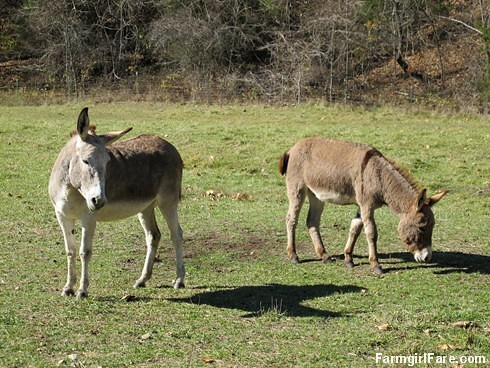 This might sound gross to you or some of your readers but have you ever used the donkeys' milk? Here in Italy, it is a big thing, in certain parts, and they make even a cheese from it. I tasted it and it tastes good. Donkeys' milk is much better and healthier than cows' milk. They also used donkeys in therapy for autistic children and traumatized kids in general. 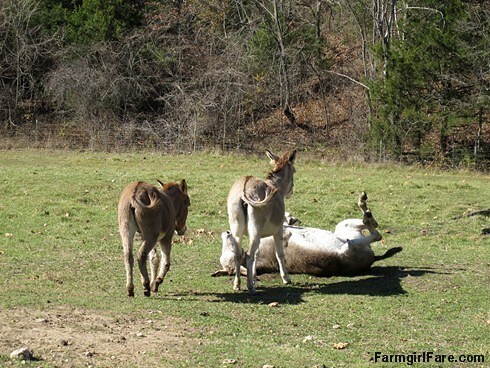 Do you use your donkeys as work animals of any sort?